Thousands of forms of Shiva are worshipped in India and around the world. Here is a collection of stories of some rare and powerful forms of Shiva. The story are mostly from Puranas especially the Kashi Kanda of the Skanda Purana. Story of Jayageeshyeshwar Shiva is associated with a sage named Jayageesh. Jayageeshyeshwar Shivling is located in Varanasi, India. Legend has it that once Shiva left Kashi and did not appear for very long period. Jayageesh Rishi performed intense austerities to bring back Shiva to Kashi. Pleased with the devotion and austerities of Jayageesh Rishi, Shiva returned to Kashi. On returning to Kashi, Shiva asked Nandi to carry a lotus flower to the Rishi. Saint Jayageesh had become very thin due to the intense austerities. He could not even walk properly. As soon as Nandi touched the Sage with lotus flower, he became very active. He found new vigor and walked along with Nandi to the abode of Shiva and Goddess Parvati. When he reached the abode of Shiva, he started singing in praise of Shiva and composed numerous mantras. Shiva was pleased with devotion and granted Sage Jayageesh a boon. As boon, Jayageesh Rishi asked Shiva to be present in the Shivling that he installed and worshipped to bring Shiva back to Kashi. Shiva granted the boon and told that those who worship the Jayageeshyeshwar Shivling will attain Siddhi and peace. He also added that devotees who worship the Shivling will be absolved of their sins. Story of Shaileshwar Shiva is found in the Kashi Khand of Skanda Purana. Temple housing the Shaileshwar Shivling is located in Varanasi. As Shaileshwar, Shiva is the Lord of the mountains. Legend has it that Giri Raj, the king of mountains, and father of Goddess Parvati once paid visit to Shiva and Goddess Parvati at Kashi. When Giri Raj reached Kashi it was night. He then thought of building a temple dedicated Shiva in a night. He assembled all highly sculptures, artisans and workers. The workers were so efficient that they built a temple in a single night. Giri Raj then installed a Shivling in the temple and named it Shaileshwar. He then left Kashi feeling extremely satisfied. Shiva Ganas who were surprised to a see temple built overnight reported the matter to Shiva. Shiva and Goddess Parvati reached the temple and realized that the temple was built by Giri Raj. Goddess Parvati was so pleased that she asked Shiva to be present in the Shivling. It is stated that those that who observe prayers to Shaileshwar Shivling will attain moksha and will never be unhappy on earth. Goddess Parvati said that those who worship Shaileshwar Shivling will be taken care of as Her children. Shaileshwar Temple is located at Mariha Ghat in Varanasi. Trilochaneshwar is one among the numerous names of Shiva. Shiva as Trilochan is the three-eyed one – he who is present in the past, present and future. Shiva is worshipped in the form of Trilochaneshwar in a temple in Kashi (Varanasi). Trilochan Shivling is found in the Trilochaneshwar Temple in the Trilochan Ghat in Varanasi. Trilochaneshwar is the eye of all the Shivlings in the world. It is believed that uttering the name Trilochan cleanses sins and one attains mukhti. Legend has it that if a person commits sin anywhere in the world, the person will get redemption in Kashi. But if a person commits sin in Kashi, the person will get redemption only by chanting the name of Trilochaneshwar. Grahpati Shiva is one of the manifestations of Shiva. The story of Shiva as Grihapati is mentioned in the Shaivagama. Grahpati means the lord of the planets. Legend has it that once the wife of Sage Vishwanar had a desire to have a son. To fulfill the desire, Sage Vishvanar went to Kashi and offered prayers to Veereshwar Linga there. After a year, Shiva appeared as a boy before Sage Vishwanar and granted him the boon that He will be born as their son. Shiva said that he will be known as Grahpati. As per the boon, Suchimati, wife of Sage Vishwanar, gave birth to Grihpati. The sage performed all the sanskaras of the boy. When the boy was nine year old, Sage Naraga visited Sage Vishwanar and told him that the boy will be struck by lightning during the 12 year of his life. Sage Vishwanar was saddened by this fact. But Grihapati said that he will go to Kashi and offer prayers to Shiva and will overcome death. Grihapati went to Kashi and made Shivling and started offering worship to it. When it was the 12th year, Indra appeared before the boy and offered a boon. But the boy was not ready to take any boon from Indra and said that he will take boon from Shiva only. Hearing the words of the boy Indra became angry and decided to punish the boy. He threatened to kill the boy with lightning. But Shiva appeared and told the boy that not even Yama can harm his devotee. Shiva gave him the boon that Agni will not touch him. The Shivling that was used by Grihapati to worship Shiva became known as Agnishwara. The Shivling is still worshiped in Varanasi. Satishwar Shiva is one among the numerous manifestations of Shiva. The story of Satiswar Shiva is associated with His marriage to Goddess Sati. Legend has it that Mother Goddess Shakti was born as the daughter of Daksha Prajapati. She was called Sati. When Sati reached marriageable age, She found no man who could become her husband. Sati then reached Kashi and offered prayers for a good husband. One day a Shivling appeared on the spot where She was praying. A voice was heard from the Shivling and it stated that She need not perform any more austerities and Mahadev Shiva will Himself become Her Husband. Shiva as the Husband of Goddess Sati is known as Satishwar. The Shivling that appeared before Sati in Varanasi is known as the Satishwar Shivling. The temple housing Satishwar Shivling can still found in Varanasi. Sthanu Shiva is one among the numerous forms of Shiva. Story of Sthanu Rudra, information about this form and mantras are found in the Shaivagam. Sthanu Rudra is the motionless pillar which is above time and dimensions. The cycles of time move around him. Creation, sustenance and destruction are willed by him. Symbolically Sthanu is timeless, motionless state of Samadhi. Shaivagam also gives a simple picture of Shiva. It states that Sthanu Shiva sits in profound meditation. He is worshiped by all beings. Goddess Parvati sits on his left side. It is stated that Sthanu Rudra on the request of living beings, comes out of his motionless state and takes Goddess Parvati as his wife. He plays various leelas for the welfare of the people. Legend has it that demon Tarakasur was creating havoc in the universe. The demon had got the boon from Brahma that only a son born of Shiva would annihilate him. The demon had learned that after the death of Sati, Shiva has entered into a timeless and motionless state. 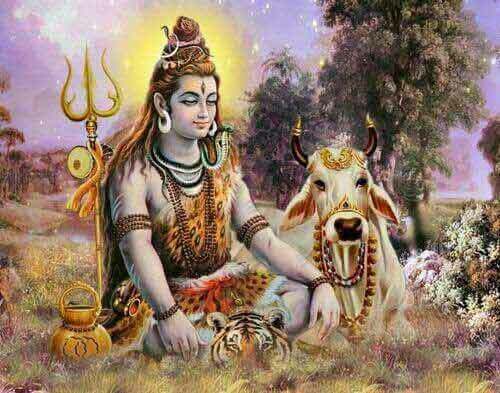 He thought Shiva will not show interest in the matters of living beings. But Sthanu Rudra came out the meditative state and took Goddess Parvati as his wife and Kartikeya was born as a result. Kartikeya then annihilated demon Tarakasura. Gangadhara Shiva is the form of Shiva that holds Ganga on his matted locks. The story of Gangadhar Shiva is associated with the arrival of Ganga on earth. Legend has it that sixty sons of King Sagara were protecting the Ashwamedha horse. The sixty sons of Sagara were known to be cruel and they practiced all forms of Adharma. Saints, human beings and Devas were fed up with their activities. All of them complained to Indra, the king of Devas. He promised to get solve the problem. It must be noted that in some Puranas it is not sixty but King Sagara had sixty thousands sons as a result of a boon. The sixty were following the horse released by King Sagara. One day Indra stole the horse and hid it at the spot where Sage Kapila was meditating. When the unruly sons discovered horse near Sage Kapila, they thought the saint had stolen it and started abusing and hitting him. Sage Kapila’s meditation was disturbed and the angry saint opened his eyes – reducing the sixty sons into ashes. Grandson of emperor Sagara reached the spot and prayed for forgiveness to Sage Kapila. The sage could not bring back the sons but he said that they will attain Moksha when in future King Bhagiratha of the lineage will bring Ganga down from heaven to earth. Ganga descended from heaven and Lord Shiva held Her in His matted locks so that the power of Goddess Ganga does not destroy the earth. Shiva thus got the name Gangadhara…one who holds Ganga in His matted locks. Kalaraja is the most ferocious form of Shiva. As Kalaraja he is the lord of time and death and even time is afraid of this form. Shiva Purana explains about this most ferocious form of Shiva who controls time and everything. Kalaraja is associated with Bhairava form of Shiva that nipped the fifth head of Brahma with His left thumb. As Kalaraja, Shiva puts an end to one cycle of creation. He devours the cosmos as Kalagni Rudra. Kalaraja form of Shiva is the various manifestations that happen during the end of a cosmos which includes Kalagni Rudra, Mahakala, Kalabhairava, Kalapursha and Bhairav. The Kalaraja form of Shiva appears when earth is filled with Adharma. When it is impossible for Mother Earth to tolerate, Shiva appears to put an end to the Adharma. Words cannot describe the form of Kalaraja. The wise does not fear the Kalaraja form of Shiva because they know that all that is here is Shiva. Ashtamurti is one among the numerous names of Shiva. Shiva as Ashtamurti is existence. He is the force behind the living. As Ashtamurti, Shiva is the creative force and life behind everything that exists. He is the one who decides when a life form undergoes transformation and takes a new form – which we refer to as death and birth. Shiva is known as Ashtamurti because He pervades the earth, water, air, fire, sky, sun, moon and living beings. Earth, water, air, fire and sky are together the five elements or Panchabhootas. Shiva as Ashtamurti is the cosmos. Everything in it rises from him and goes back to him. As Ashtamurti, Shiva dances revealing time and eternity. The dance subdues and controls Yama, the god of death. Ashtamurti is depicted as dancing with a Veena and one of his hands is in the Chinmudra. Kalidasa identifies Ashtamurti with Ardhanarishvara. Nagachandresvara is the murti of Shiva that is worshipped on the uppermost tier of the Mahakaleshwar Temple in Ujjain. The darshan of the murti only happens on Nag Panchami day as per traditional Hindu calendar followed in North India. Shiva is the one who wears nagas or snakes as ornaments. Chandra, the moon god, adorns the matted locks of Shiva. Thus he is Nagachandresvara Shiva. Nagachandresvara murti at Mahakaleshwar Temple in Ujjain is very ancient and very unique. Thousands of devotees queue up on Nag Panchami day for the rare darshan of this murti. Baijnath Shiva Temple is located at Purulia in West Bengal. There is an interesting story related to the Baijyanath Temple. The story shows that what matters is unwavering devotion not rituals and namesake worship and prayers. Legend has it that the present day Baijyanath Temple was neglected by priests and devotees as it was in a dilapidated state and was in the jungle. Baiju, a woodcutter, in the region used to reverently tap the linga at the temple daily with his axe before going into the jungle for cutting the wood. He continued this practice for years. Once a group of priests who came to have a look at the temple saw, Baiju tapping the linga with his axe. They felt this was as insult and cursed Baiju that for this blasphemous act he will be destroyed by the third eye of Shiva. Suddenly a voice came out from the linga stating that Baiju is my favorite devotee and no power in the world will destroy Him. Without fail he regularly comes and taps me. His this action is more pious and earnest than the distracted rituals and prayers of yours. The story spread far and wide and people started worshipping the Linga and it came to be known as Baijyanath. Maheshwara is one among the numerous names of Hindu God Shiva. Legend has it that Shiva got the name Maheshwara during the fight against the Tripurasuras who ruled the Tripuri. Tripura or Tripuri are the flying cities made of Gold, Silver and Iron. Demons Tarakaksha, Maya and Vidyunmali ruled over the three cities. The three demons had propitiated Brahma and as boon asked for immortality which was denied and later they asked for three fortified cities which could fly around and could only destroyed with one shot of an arrow. Devas failed to dislodge the demons from the cities and they lost control over the heaven. Finally, Devas approached Shiva and He agreed to destroy the cities. Vishwakarma built the chariot for the mission. The Charioteer was Brahma. Earth was the body of the chariot. Sun and Moon where the wheels of the chariots. The four Vedas became the four steds. To achieve success in the fight against the three demons, Shiva sought and obtained one half of the strength of all gods and from then onwards he was called Maheshwara, because he became the greatest among them. Brahma raised the chariot up and waited for the cities to align in a single line. This happened only for a split of a second. Even this split of a second time was more for Maheshwara, who shot the arrow through the three cities burning them down. The asuras were killed and Dharma was restored. Pitreshwar is one among the numerous names of Shiva. 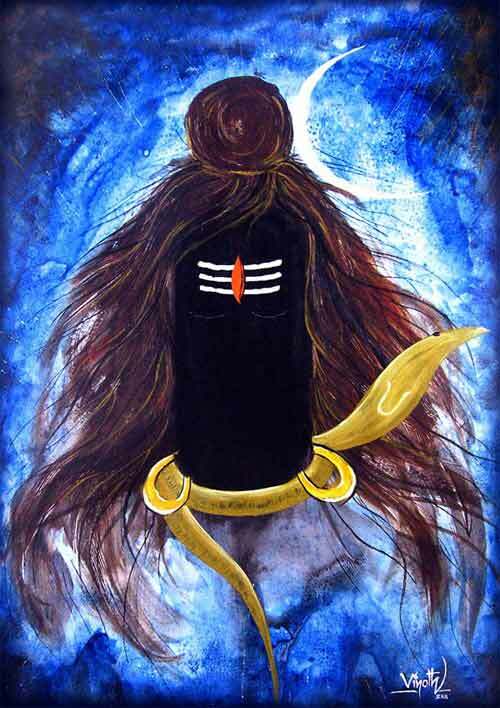 As Pitreshwar Shiva, he is the lord of the pitrus. He governs over the dead. Pitreshwar is worshipped in the form of Shivling. Temples dedicated to this manifestation of Shiva are found in Varanasi and Gaya – both the places are famous for rituals associated with the dead. The popular belief is that those who offer prayers to Pitreshwar will have the blessing of ancestors. It is also believed that performing rituals and worship to Pitreshwar will help in redemption of sins of ancestors. This will help them in attaining moksha or liberation. One of the famous Pitreshwar temples is located at Varanasi. There is also Pitri Kund (pond) in the vicinity of the temple. Devotees take holy dip the Kund and offer prayers for the welfare of ancestors. Veersehwar is a manifestation of Shiva and is believed to have appeared to rescue an ardent devotee. This devotee was a 16-year-old boy. This manifestation of Shiva is worshipped as Atma Veereshwar in Varanasi. Legend has it that King Amitrajit and Queen Malayagandini had a male child. The child had attained the age of 16 immediately after his birth. Astrologers who looked into the horoscope predicted that the child will have to be killed otherwise the king will die. In order to save the king, the queen decided to kill the boy. The boy was ordered to be taken to Kashi and killed. However, nobody was ready to kill the boy. The boy then offered prayers to Shiva at Kashi; here Shiva appeared before the boy as Veereshwar. The boy was told that nothing would happen to his father due to his birth. On the request of the boy, Shiva decided to be present in the form of Atma Veereshwar Shivling. Legend has it that offering prayers to Atma Veereshwar Shivling in Kashi will help in attaining peace, health and prosperity. Childless couples have found relief after offering prayers to Veersehwar Shiva. Dhareshwar Shiva is a manifestation of Shiva mentioned in the Kashi Khand of Skanda Purana. Dhareshwar Shivling is worshipped in Varanasi and in western parts of India especially in Pune and near Gokarna in Karnataka. Dhareshwar is also one of the pancha kshetras or five holy places viz., Gokarna, Murdeshwar, Dhareshwar, Gunavante and Sejjeshwar. The popular belief is that worshipping Dhareshwar Shiva will help in attaining moksha. As Dhareshwar, Shiva is the one who supports the universe and the five elements. Another belief is that Shiva is Dhareshwar because he controls the flow of Ganga River on Earth. Earth was not capable of taking the flow of Ganga from heaven. To control the huge powerful flow of Ganga, Shiva took Her on His head. When Shiva is Dhareshwar, Goddess Shakti appears as Dhareshwar Devi. Rudreshwar is a manifestation of Shiva. He got the name after He annhilated Gajasura – the elephant and wore its skin. Rudreshwar appeared in the form of Shivling at Kashi. This is mentioned in the Kashi Khand in the Skanda Purana. The popular belief is that those offering prayers to Rudreshwar will attain moksha or liberation. 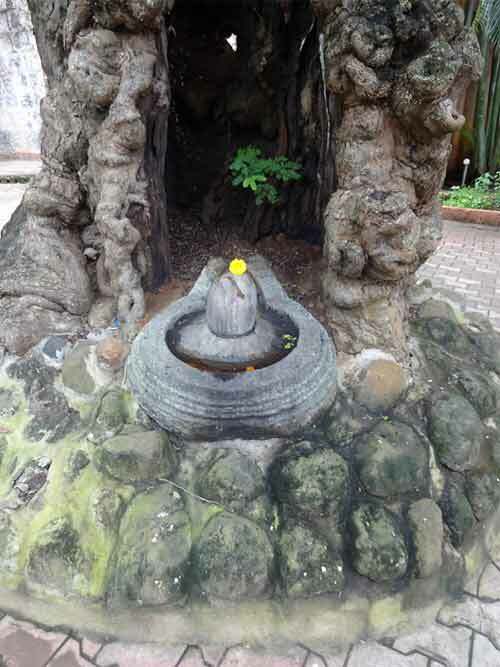 Rudreshwar Shivling is currently located near the Tripura Bhairavi Temple. A Rudra kund (pond) was located near the Rudreshwar Shivling – the pond no longer exists. The popular belief is that taking bath in the kund is highly meritorious especially when Chaturdashi (14th day of fortnight) and Arda Nakshatra coincides. As Rudra Kund no longer exists people take bath in holy Ganga River on the day.